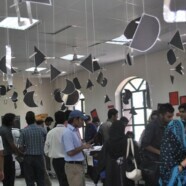 On 20 May 2010 the Department of Computer Science & IT organized a daylong event, CIRCUIT MANIA, with the theme of DIGITALING EVIL THOUGHTS. The event was held from 9:00 am to 4:00 pm in N-217. The event was organized under the supervision of Assistant Professor Rabea Adan, Department of Computer Science. Dr Jerald Kabell, Chairperson and Professor of the department, was a great help in obtaining funding and space for the event and Dr Sufian Aslam, Chairperson and Professor of the Physics Department, arranged the equipment and provided a lab for a week for the participants.